The Le Cache wine credenza is available in several styles and wood options to create the perfect wine storage unit for your home. 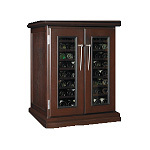 Please click here to connect to our Le Cache Wine Credenzas. 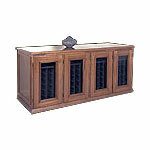 Any of the Cavavin custom wine cabinets are available in the lower sideboard model or wine credenza. With Cavavin, you need to choose the desired exterior finish and then the size model required. Please click here to connect to our selection of Cavavin wine credenzas.